BELVOIR – Stewarts & Lloyds (Minerals) Ltd., Woolsthorpe Quarries, Leicestershire. 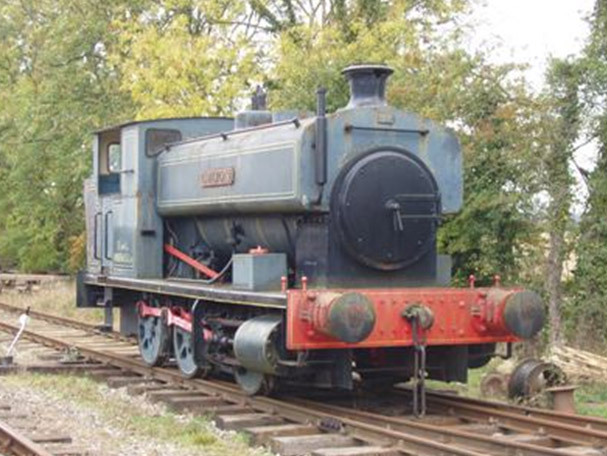 Delivered new on 11th January 1954, this loco was a long time resident of the historic Harston locomotive shed which stood at the heart of the Woolsthorpe Quarry system. Of a type which became almost a “standard” on the Buckminster, Market Overton and Woolsthorpe systems, this locomotive saw out an uneventful and surprisingly short industrial life entirely at Harston. In the initial days of preservation projects in the early 1970’s many ironstone locos were sold by a willing management for further use. BELVOIR was one of the lucky few and left Harston in January 1972 for preservation at Chapel & Wakes Colne in Essex. After working for a number of years the private owner donated the loco to our museum with the intention that we will restore it to operational condition in due course as one of our larger locomotive fleet. The loco is currently stored pending restoration commencing shortly. The loco still carries the distinctive water treatment tube carried by most of the Stewarts & Lloyds Minerals locos.